Serotonin is one of the “feel good” neuromodulators floating around in the central nervous system, however, it doesn’t just play a role when it comes to our mood. Serotonin plays a very important role in transmitting impulses between nerve cells. More specifically, it affects the excitability of our motoneurones, the cells that link our spinal cord to our muscles. We know that serotonin is released with activity and that it excites these motoneurones and helps production of muscle force, but can too much serotonin during fatiguing exercise also limit our ability to produce force? In this study we aimed to tease away at the mechanisms contributing to muscle fatigue in humans. We know that, despite pushing our hardest at times, we just can’t make our muscles do their best. One reason for this reduction in muscle force appears to be a type of inhibition of the activity of our motoneurones. Although inhibition of these cells during fatiguing contractions has been well demonstrated (McNeil et al. 2009, 2011), the mechanisms behind this inhibition still remain largely unknown. A recent study in turtles showed that during periods of intense drive to the motoneurones, serotonin spills over from excitatory receptors onto inhibitory receptors (serotonin 1A subtype) located further away on the motoneurones (Cotel et al. 2013). More specifically, these inhibitory receptors are located at a spot which is very important for the generation of electrical impulses by the motoneurones (axon initial segment). These receptors are also present in the human spinal cord. Therefore, we undertook translational research to determine whether serotonin 1A receptors could potentially inhibit motoneurone activity and contribute to the muscle fatigue that humans experience during and following intense exercise. We did this by using buspirone, a drug that activates serotonin 1A receptors. In a double-blind, placebo-controlled study we measured motoneurone responses before and after drug administration. Left: Motoneurone under conditions of low/medium serotonergic (5HT) drive. 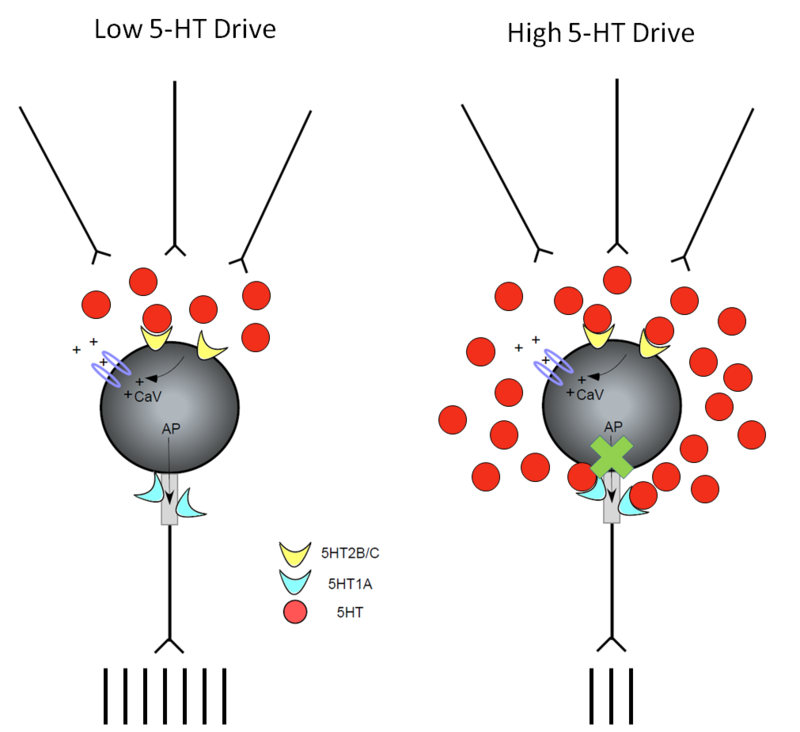 5HT binds to excitatory 5HT2 receptors located on the soma and dendrites which are in close proximity to the serotonergic axons. This results in increased motoneurone excitability (increased number of action potentials). Right: Motoneurone under conditions of high serotonergic (5HT) drive. 5HT spills over and binds to inhibitory 5HT1A receptors located at the axon initial segment, which would not normally be activated. This results in decreased motoneurone excitability (decreased number of action potentials). We administered buspirone to 10 healthy individuals. We measured motoneurone responses in two ways: F waves and cervicomedullary motor evoked potentials (CMEPs). We stimulated the peripheral nerve to activate all the motoneurones antidromically and measured any recurrent motoneurone discharge. These recurrent responses are known as F-waves and depend only on the excitability of the motoneurones themselves. Cervicomedullary motor evoked potentials are elicited through electrical stimulation of the descending corticospinal tract and activate the motoneurones synaptically. This is similar to how we activate the motoneurones when we produce a voluntary movement. Both types of motoneurone responses were significantly depressed following ingestion of buspirone by approximately 30% when compared to placebo. Depression of motoneurone responses by buspirone indicates that inhibitory serotonin 1A receptors are located on human motoneurones and can significantly reduce motoneurone output. We propose that during periods of intense drive to the motoneurones, such as during fatiguing contractions, excessive release of serotonin may activate these inhibitory receptors. This would make it harder for our brains to drive motoneurone activity, thereby reducing our ability to produce muscle force. Hence, while some serotonin is good for exercise, too much could contribute to fatigue. D’Amico JM, Butler AA, Héroux ME, Cotel F, Perrier JM, Butler JE, Gandevia SC, Taylor JL (2016). Human motoneurone excitability is depressed by activation of serotonin 1A receptors with buspirone. J Physiol. Epub ahead of print. DOI: 10.1113/JP273200. Cotel F, Exley R, Cragg SJ, Perrier JF (2013). Serotonin spillover onto the axon initial segment of motoneurons induces central fatigue by inhibiting action potential initiation. PNAS 110:(12), 4774-4779. McNeil CJ, Giesebrecht S, Gandevia SC, Taylor JL (2011). Behaviour of the motoneurone pool in a fatiguing submaximal contraction. J Physiol 589:(Pt 14), 3533-3544. McNeil CJ, Martin PG, Gandevia SC, Taylor JL (2009). The response to paired motor cortical stimuli is abolished at a spinal level during human muscle fatigue. J Physiol 587:(Pt 23), 5601-5612. ← How do we maintain reaching accuracy during body movement?